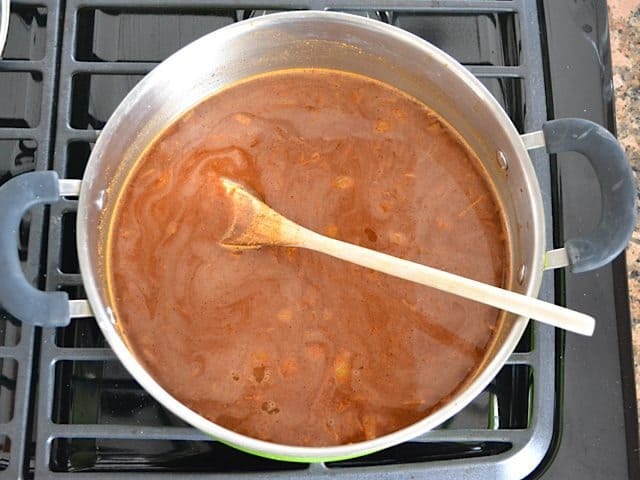 Earlier this week I got an email from a reader, Katie, telling me about how she used my homemade red enchilada sauce in her favorite tortilla soup recipe and how amazing it was. That whole idea sounded so divine that I had to make some myself! So, if you’re a fan of my Easy Red Enchilada Sauce, you’ll probably like this soup. It’s like a big bowl of the sauce (thinned out a bit) with lots of yummy beans and vegetables. Eat it plain or top it with a bunch of fun stuff—either way you’re gonna love it! I started this soup out very similarly to my red enchilada sauce, but used cornmeal as a thickener instead of regular flour. 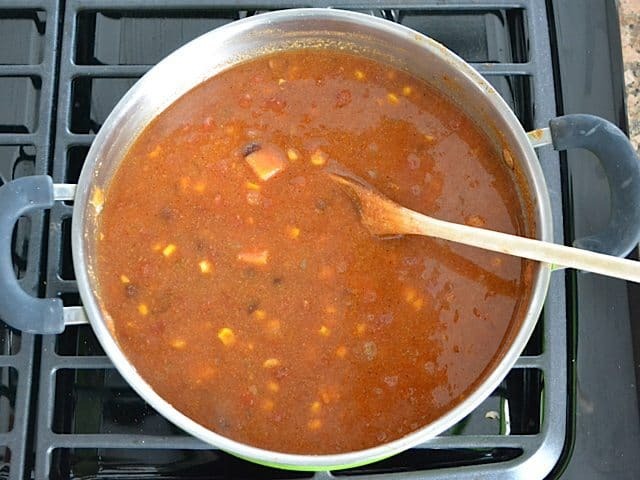 To the yummy sauce I added vegetable broth, diced tomatoes, black beans, corn, and SWEET POTATOES. 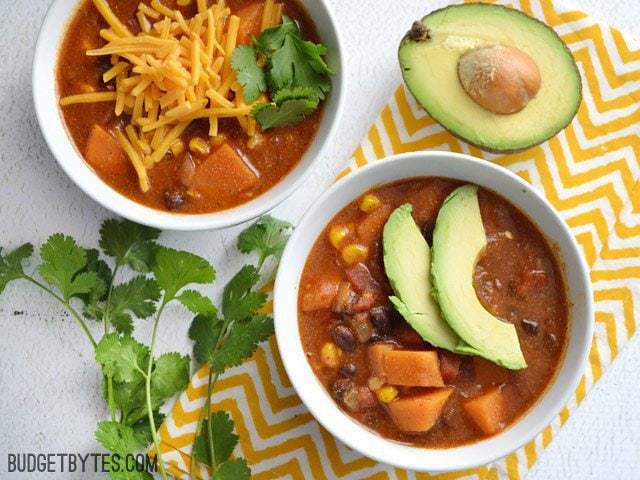 Because if you know me at all, you know how I love pairing sweet potatoes with southwest flavors! YUM. 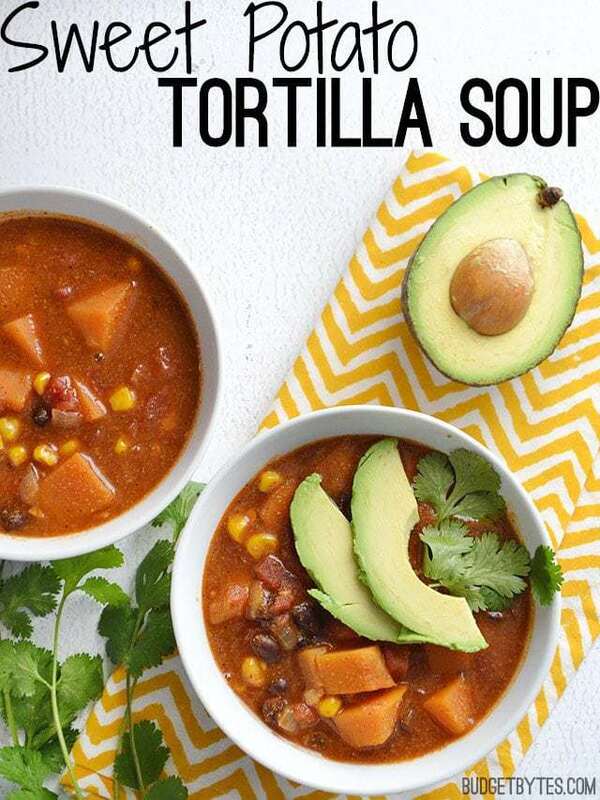 The sweet potatoes gave the soup a subtle sweetness, belly filling power, and was a really inexpensive alternative to the usual chicken in tortilla soup. I call that a win! Tortilla soup usually uses masa harina (corn flour) to thicken the broth and give it that nice tortilla-like flavor, but I didn’t want to go buy a whole bag of masa harina just for this soup. Realistically, I didn’t see myself using up the rest of the bag to make tortillas anytime soon, so I decided to substitute with cornmeal. Cornmeal is a pretty close cousin to masa harina. It’s corn ground into fine granules, instead of a fine powder like masa harina. You can pulse the cornmeal in a food processor or blender to make it into flour and give you a smoother soup, but I just added it as is. My soup did have the soft corn “granules” in it, which I didn’t mind, and it still thickened up nicely. So, keep that in mind when deciding to use either cornmeal or masa harina. If you’re a texture sensitive person, go get some masa harina or pulverize your cornmeal. Masa harina can usually be found in the ethnic food aisle or in the baking aisle by the flour. Another bonus: as long as you make sure your broth or bouillon is gluten free, your soup will be too! 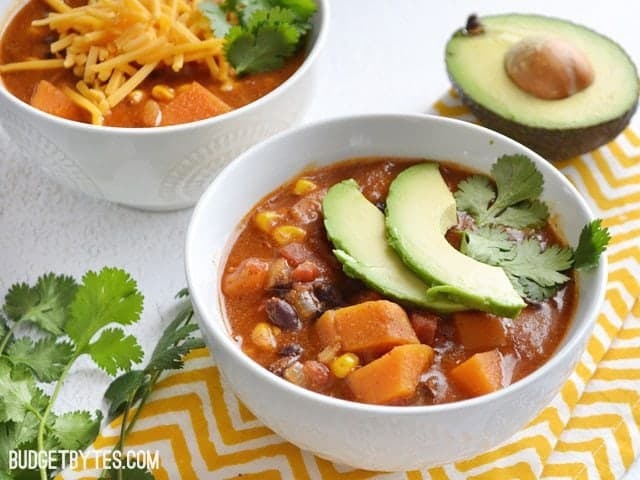 Sweet potatoes add a subtle sweetness to balance the heat for a unique twist on a classic tortilla soup. Dice the onion and mince the garlic. 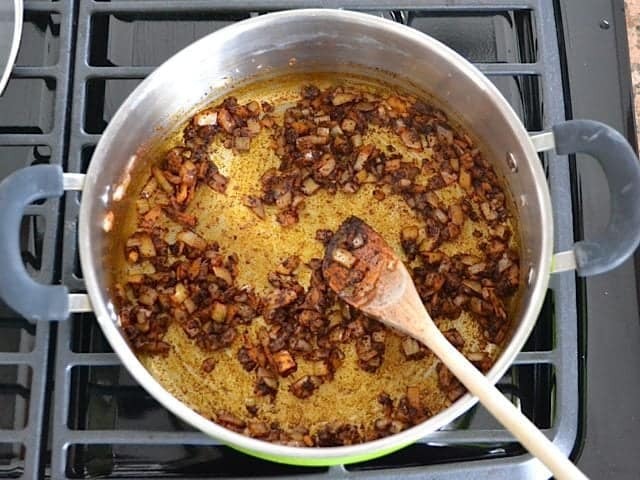 Sauté both in a large pot with the vegetable oil over medium heat for 3-5 minutes, or until transparent. Add the chile powder, cumin, and cayenne to the pot. Continue to sauté for one minute to toast the spices. Add the masa harina or cornmeal and continue to sauté for 2-3 minutes to toast the starch. The corn will stick to the bottom of the pot as you sauté, so turn the heat down slightly if needed to prevent it from burning. Whisk the vegetable broth into the corn mixture and allow it to come up to a simmer. The liquid will begin to thicken slightly when it starts to simmer. Add the tomato paste and stir until it dissolves in. Add the can of diced tomatoes (with juices), black beans (drained and rinsed), and frozen corn kernels. 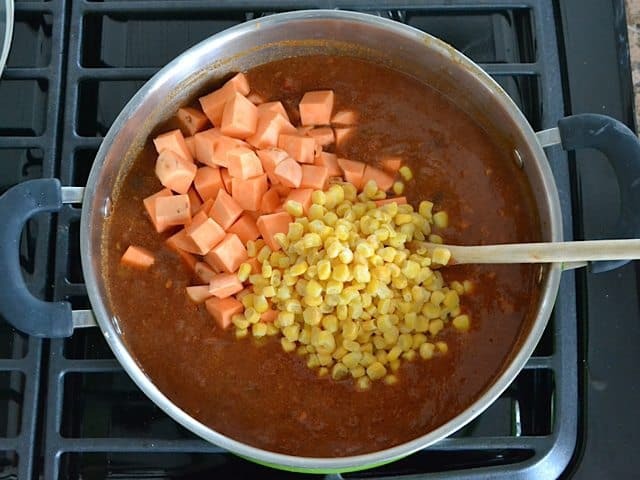 Peel and cut the sweet potato into 1/2 inch cubes, then add it to the pot. Cover the pot and allow the soup to come up to a simmer over medium heat. Once it begins to simmer, turn the heat down to low and let simmer for 30 minutes, or until the sweet potatoes have softened. Stir the soup occasionally as it simmers to keep the corn from sticking to the bottom of the pot. Taste the soup and adjust the salt if needed (this will depend on the brand of broth you use and the canned goods). *The chili powder used here is a mild blend of chiles and other spices. It is not ground red chiles (like cayenne), which are usually very spicy. **You can whiz cornmeal in a food processor or blender to make it into a powder like masa harina. 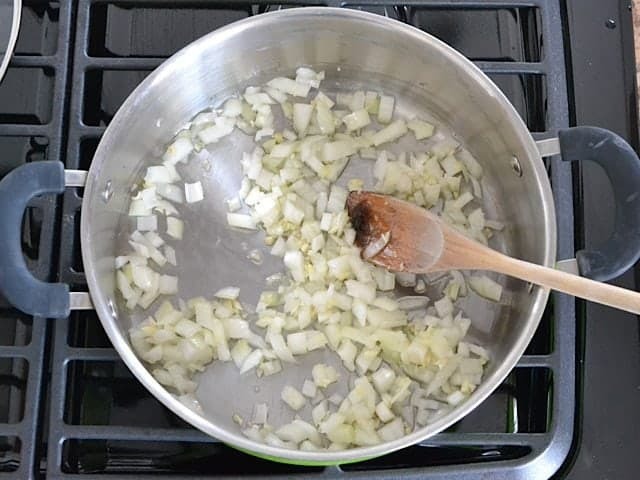 Like a lot of good soups, this one starts with one diced onion and two minced cloves of garlic, sautéed in 2 Tbsp of vegetable oil. Sauté over medium heat for 3-5 minutes, or until they’re soft and transparent. 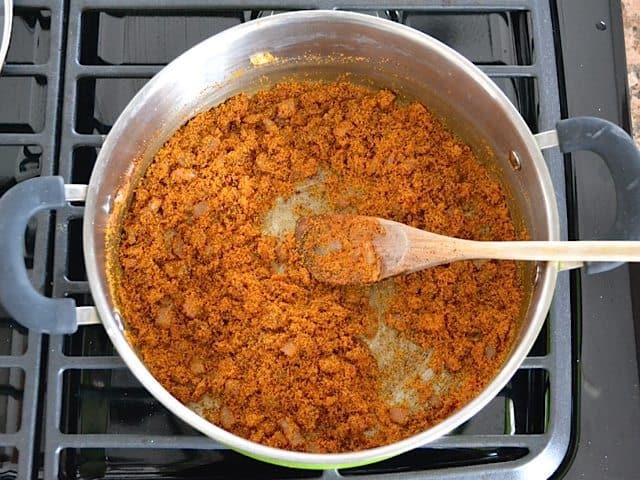 Once the onions are soft, add 2 Tbsp of chili powder, 1 tsp ground cumin, and 1/4 tsp cayenne pepper. Sauté the spices with the onions and garlic for about a minute more, just enough to slightly toast the spices. Add a 1/2 cup masa harina or cornmeal and continue to sauté for 2-3 minutes more. The corn will stick to the bottom of the pot a bit, so just make sure to keep stirring and turn the heat down if it looks in the danger of burning. This toasts the corn and deepens the flavor. If you want a smooth soup, use masa harina or make sure to pulverize the cornmeal in a food processor or blender to make it into a powder. Whisk 6 cups of vegetable broth into the corn mixture. Let the mixture come up to a simmer over medium heat, at which point it will start to thicken a bit. Add the tomato paste and stir it in until dissolved. Add one 15oz. can of diced tomatoes (with juices) and one 15oz. 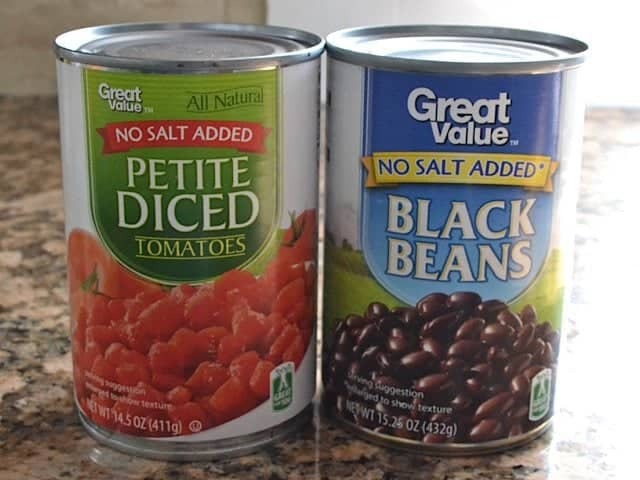 can of black beans (drain and rinse them briefly). You don’t have to get “no salt added”, I just happened to grab those. Also, it doesn’t have to be “petite diced” tomatoes, regular diced is okay. You can even get a can of diced tomatoes with green chiles, for more flavor. While you’re waiting for the ingredients to sauté in the earlier steps, you can peel and cube a sweet potato (about one pound in weight). Cut the sweet potato into 1/2 inch cubes so they don’t take too long to cook. Also add 1 cup frozen corn kernels. Place a lid on the soup and let it come up to a simmer over medium heat. Once it begins simmering, reduce the heat to low and let it simmer for 30 minutes, or until the sweet potatoes are soft. Stir it occasionally as it simmers to keep the corn from sticking to the bottom of the pot. This soup is very flavorful and fantastic on its own, but toppings are always fun. 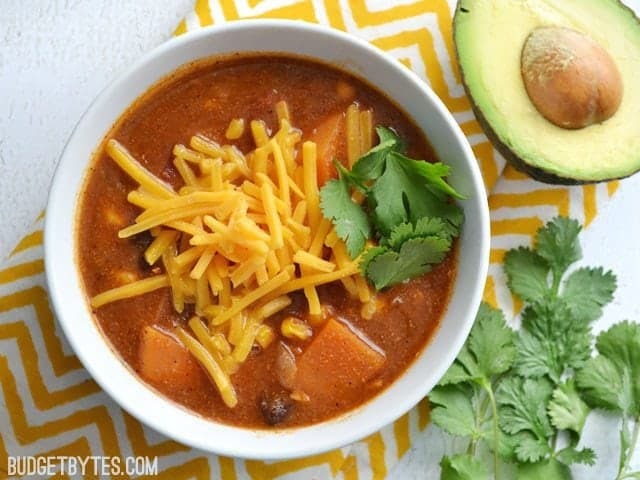 Try shredded cheddar, cilantro, avocado, crispy tortilla strips or chips, or sour cream. NOM. Just try not to get too carried away, or you’ll double the price in the blink of an eye! Wow, this soup is fantastic! The masa harina adds a lot of depth. I used 4 cups of vegetable broth rather than 6 cups because my pot wasn’t large enough, but the soup still turned out great. Thank you for the amazing recipe! This may sound weird but this is a great soup to “hide” kale in! I just destem it and slice the leaves up really thin. You know how much kale cooks down…you can add a ton without compromising the recipe. The kale just ends up tasting like the soup and doesn’t really affect anything. This was better than what I expected. Not only was it delicious, but it lasted me several days. I was not able to find vegetable broth at the supermarket so i bought stock instead. I was a little nervous, but the results were really good. It tastes like tortilla chips! But it’s a soup! What new kind of devilry is this?! This was really good! I added an extra sweet potato and a handful of spinach. Next time I make this I’ll probably add more spinach. Can I make this in the crockpot? was wondering this too, did you try it? To thicken the soup without corn meal just mash some of the beans with a fork before adding.